"Seth and his little brother Henry haven’t had the most stable of upbringings. Their father has been in and out of jail; their mother took off years ago and hasn't been seen since. Life is constantly uncertain - but a twist of fate could be just what they need. August stopped drinking the day his son died. While on a journey that’s very close to his heart, a breakdown leaves him stranded in a small town and at the mercy of the local mechanic - Seth and Henry’s father. But then August is presented with an offer he doesn't expect: take the two boys with him for the summer, and pay no charge for the repairs. As the unlikely trio set out on their road trip, the most unlikely, unforgettable friendship begins to take shape. Take Me With You is a moving, thought-provoking story that fans of Jodi Picoult, Susan Lewis or Diane Chamberlain will love, or the perfect read for those looking for something special to curl up with." Catherine Ryan Hyde is not an author I had come across before until this book dropped through my letterbox recently; thank you to Transworld/Black Swan for sending me the copy because without you I may never have stumbled across what turned out to be such a beautiful book. In fact, the book was so beautiful that at the outset I found myself constantly wanting to cry and I knew early on that I would regret reading it in public on the train to work. Take Me With You is the sort of book that you need to set hours at a time aside to read because you will not want to put it down. Quite simply, it is tender, endearing and the most touching, heartfelt book I have read in some time. I liked the first part of the book the best when Seth and Henry are young and I wished we never had to leave this part of their lives. Then, just as you think it cannot get any more heartbreaking...it does. The final parts of the book bring everything together in a rewarding way and although I never wanted it to end, the ending is ultimately uplifting. The places they visit and the sights they see are breathtaking but actually what outshines all of that is the relationships between August, Seth and Henry. Those relationships are just beautiful and my absolute favourite relationships were August and Henry (as a young boy) and the relationships with Woody! Take Me With You is not just a story of August, Seth and Henry's literal journey across America but it is an emotional journey that will change each of their lives forever and it is a book that will stay with me long after I turned the last page. 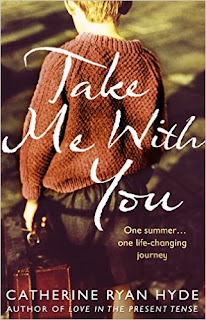 Thank you to Transworld/Black Swan for sending me a copy of Take Me With You which is out NOW.